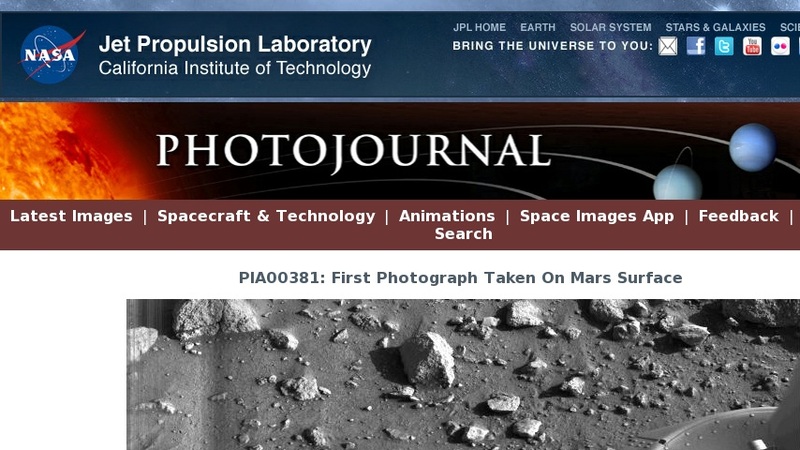 This is the first photograph ever taken on the surface of the planet Mars. It was obtained by Viking 1 just minutes after the spacecraft landed successfully early today. The center of the image is about 1.4 meters (five feet) from Viking Lander camera #2. We see both rocks and finely granulated material--sand or dust. Many of the small foreground rocks are flat with angular facets. Several larger rocks exhibit irregular surfaces with pits and the large rock at top left shows intersecting linear cracks. Extending from that rock toward the camera is a vertical linear dark band which may be due to a one-minute partial obscuration of the landscape due to clouds or dust intervening between the sun and the surface. Associated with several of the rocks are apparent signs of wind transport of granular material. The large rock in the center is about 10 centimeters (4 inches) across and shows three rough facets. To its lower right is a rock near a smooth portion of the Martian surface probably composed of very fine-grained material. It is possible that the rock was moved during Viking 1 descent maneuvers, revealing the finer-grained basement substratum; or that the fine-grained material has accumulated adjacent to the rock. There are a number of other furrows and depressions and places with fine-grained material elsewhere in the picture. At right is a portion of footpad #2. Small quantities of fine grained sand and dust are seen at the center of the footpad near the strut and were deposited at landing. The shadow to the left of the footpad clearly exhibits detail, due to scattering of light either from the Martian atmosphere or from the spacecraft, observable because the Martian sky scatters light into shadowed areas.